THAT'S NICE DESIGN: Where's all that nice design been for the last 6 months?! An online space to keep all those design finds we say 'that's nice' to. Could be anything design related from typography to fashion to commercials to wrapping paper. Enjoy the randomness and be inspired. Where's all that nice design been for the last 6 months?! Well, firstly, happy new year! I hope 2012 is a great year for you all... You may have been wondering why this blog hasn't been updated in so long and my excuse is I had a baby! We had a little son early August and has since taken up all my time..! But he's very cute so I'll let him off. Whilst it has been difficult to get onto the laptop I have been beavering away on my iPhone getting addicted to pinterest. If you haven't yet come across pinterest it's a great site that allows you to save all that nice design you spot on the Internet and save all the images in digital mood boards for future reference. I think I've set myself 100 arty crafty projects to do and need to buy a mansion to fulfil all these great interior design ideas I've found on the site! That could be the next post! Along with my pinterest addiction and becoming a mother I also signed up to a surface pattern design course featuring the highly talented designer Rachael Taylor. Module 1 is completed with modules 2 and 3 still to go. 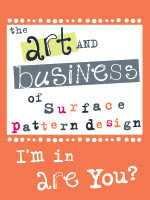 If you have an interest in surface pattern design I really recommend looking into the course, I've been very inspired. So what's in store for that's nice design in 2012? I will hopefully start posting up some cool design finds much more regularly, try to do one special feature a month from interviews to design themes and twitter more!